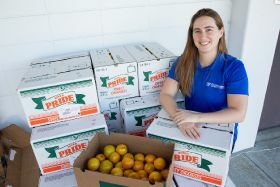 Higher prices offset production declines during Florida’s 2016/17 citrus growing season and so the industry’s overall economic contributions changed little from 2015/16, according to a new report from economists with the University of Florida Institute of Food and Agricultural Sciences Economic Impact Analysis Program (EIAP). Titled 'Economic Contributions of the Florida Citrus Industry in 2016-17', the report was formally presented to the Florida Department of Citrus this week, which commissioned the document. The report covers economic activity from October 2016 through September 2017 but does not incorporate losses caused by Hurricane Irma, said Christa Court, EIAP assistant director and one of the report’s authors. Although the storm struck Florida on 10-11 September 2017, by that time Florida’s 2016/17 crop had already been fully harvested and, thus, Irma had no effect on citrus production statistics for the season, she said. “We’ll see declines associated with Hurricane Irma reflected in the 2017/18 data, which we’ll report next fall,” said Court, who is also an assistant scientist with the UF/IFAS food and resource economics department. In the 2016/17 growing season, Florida’s citrus industry contributed US$7.241bn in industry output (sales revenue) to the state’s economy and supported more than 50,000 jobs, when multiplier effects are considered. Florida’s growers received US$1.182bn for the fruit they sold – what’s sometimes called 'farm-gate value'. The state’s total citrus fruit harvest during the 2016/17 season was 78.4m boxes – the smallest harvest since 1944/45, she said. The increase from the 2015/16 to 2016/17 growing seasons was about 1.36 per cent in constant-dollar terms, Court said, adding that during the same period, employment and labor income decreased 2.18 per cent and 0.73 per cent, respectively. In the new report, Court and the project team used updated methods to assess the 2016/17 season, and also used them to re-estimate the state citrus industry’s total economic contributions for the 2014/15 and 2015/16 growing seasons, to more accurately assess trends in the overall economic contributions of the industry. Court cautions that, due to the change in methodology, statistics contained in this latest report should not be compared with results found in previous editions of the report series. The total industry output contribution for the 2014/15 growing season is now restated as US$7.252bn, and the total output contribution for 2015/16 is now restated as US$7.144bn, Court said. The primary reason for the continued decline in Florida citrus production, she said, is the bacterial disease Huanglongbing, also known as HLB or citrus greening disease. First reported in Florida in late 2005, the disease has since become established throughout the state’s commercial citrus production areas. Scientists have not yet developed a method for conferring resistance to trees or curing them of the disease. Court developed the report with food and resource economics department colleagues Caleb Stair, Mohammad Rahmani and Alan Hodges, the programme’s director.